Looking for sample source code in ASP.net MVC and Entity Framework? Check out this article to find one such sample application using Asp.Net MVC and Entity Framework. 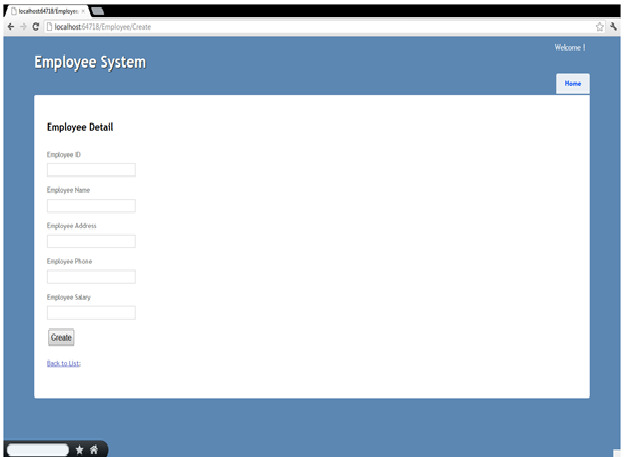 This is an employee system application coded using Asp.Net MVC and entity framework. 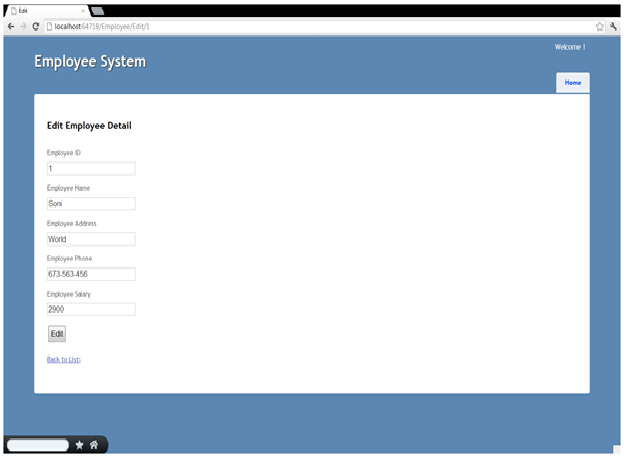 Employee System is basic application build from the ASP.net MVC and Entity Framework. It has CRUD operation like Create, Edit, Delete and View Detail functionality. I have built the same application with static data in my previous post, now I am taking one step ahead to use the database to store our data. To work with database I will be using Entity Framework which was introduced with .Net 3.5 SP1 and had much improvement in .Net 4. Below is the screen shot which we will be building today. Please read my first article to know more about the MVC and how to create the MVC based application. 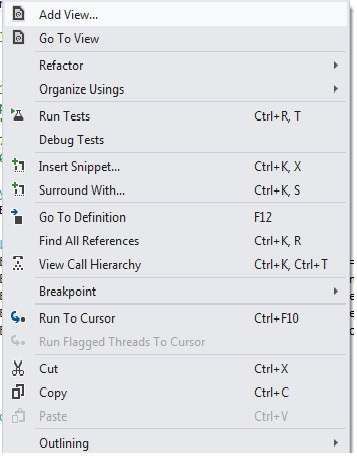 In this post I will be using the same view but modified controller and model with EF (Entity Framework) support. To complete this post I will be using some parts of my first post as I am building this application on top of that. As I mentioned controller and view are almost same as first application but with some changes in controller and the changes are done on Model to use the code first approach of EF. Let's see our modified model class which is POCO class (Plain Old CLR Objects). It is simple class without extending any class or implementing any interface. In Code first we don't have to create a database first instead we can build the model which will define the domain model objects for our application. 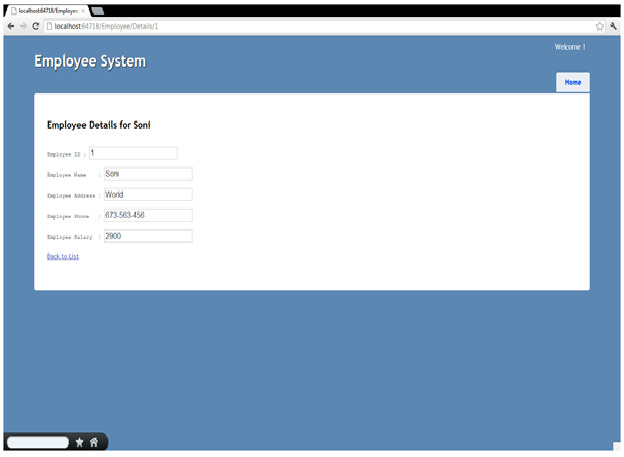 Our Employee application is simple so as our model will be simple too and it's shown below. I have not change the annotation which we were using for our validation. We have created our POCO model class, now let's create a context class that we can use to handle the retrieval/persistence of Employee instances from database. I named as EmployeeDBContext and it is derived from DbContext class. It has one property which exposes Employee Data Set. DbContext and DbSet are key in Entity Framework, both are in System.Data.Entity namespace. You need to add the reference if it is not added. That's all we need to build our application, now you will be thinking where the database is and how it will be mapped to our model.Let's take a look into those concept below. EF "Code First" supports a convention over configuration approach that enables you to do mapping using conventions instead of doing explicit configuration. In our application, Model Employee class will be the database table under your database. 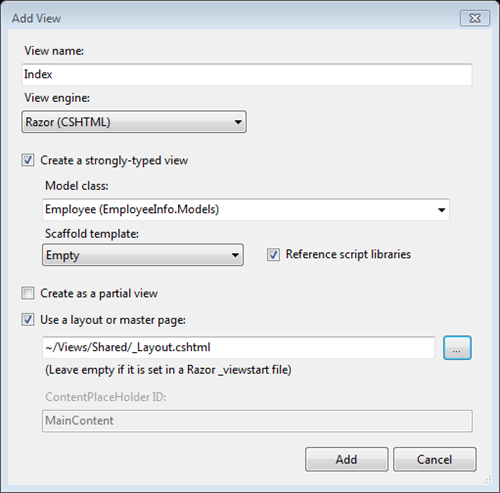 EmployeeDBContext class will be map its Employees to "Employee" table within database. 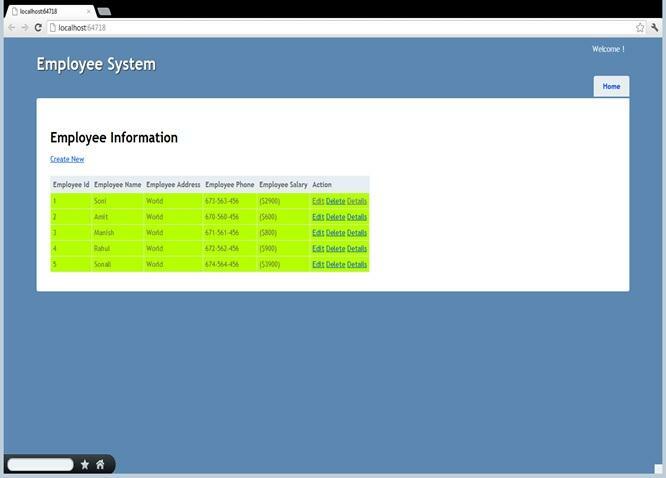 Each row in the Employee table will map to an instance of our Employee Class. In connection string I mentioned to use the Employees.sdf (SQL Server Compact Database) under the APP_DATA folder. When you run the application if the database is not there it will create the Database and Database Table using the model objects class. Controller has been rewritten to use the EF "Code First" fluent API to create, retrieve, find and save the data in database. post your code zip format then how to include mvc in vs2012? I tried in past, its due to the size of project and lots of files in MVC the size is bigger then DNS support for now. I am interested to see the source code of this project. Have you uploaded it anywhere? Can you please send me this code on ashakulkarni2707@gmail.com mail id.